Australia rode on a disciplined all-round effort to beat Sri Lanka by 41 runs and avoid a clean sweep in the third and final Twenty20 International at the Adelaide Oval here on Wednesday. Skipper Aaron Finch (53) and Michael Klinger (62) helped Australia post a mammoth 187/6 after being sent in to bat before James Faulkner and Adam Zampa shared six wickets between them to restrict the islander for 146 in just 18 overs. Finch's 32-ball knock was laced with five fours and three massive sixes while Klinger consumed 43 balls with six boundaries and a six. Travis Head (30) and Ben Dunk (28) also chipped in with useful contributions to push the score past the 150-run mark. In reply, the visitors kept losing wickets at regular intervals as only Dilshan Munaweera (37) and Milinda Siriwardana (35) managed to offer some resistance before being bowled out for a paltry 146. 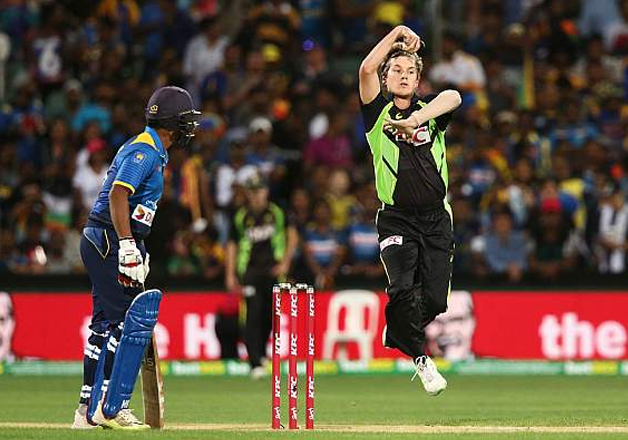 For the hosts, Faulkner returned with figures of 3/20 and Zampa took 3/25. Jhye Richardson and Head also picked one wicket each. Sri Lanka had won the previous two matches, helping them to clinch the series 2-1. Brief Scores: Australia 187/6 (Michael Klinger 62, Aaron Finch 53, Dasun Shanaka 2/27) beat Sri Lanka 146 (Dilshan Munaweera 37, Milinda Siriwardana 35, James Faulkner 3/20, Adam Zampa 3/25) by 41 runs.